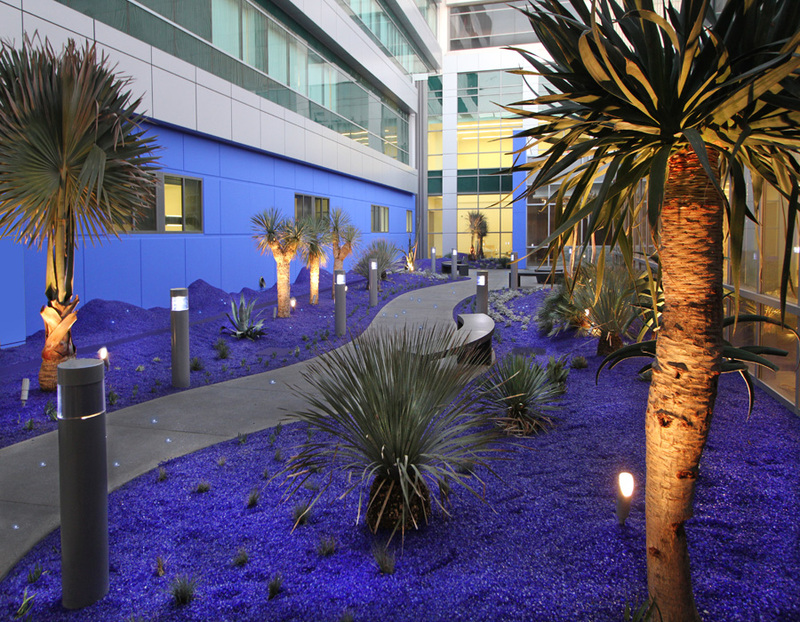 The Azul Healing Garden at the MLK Hospital in Los Angeles was conceived as a calming central courtyard in a stressful and arid urban environment. 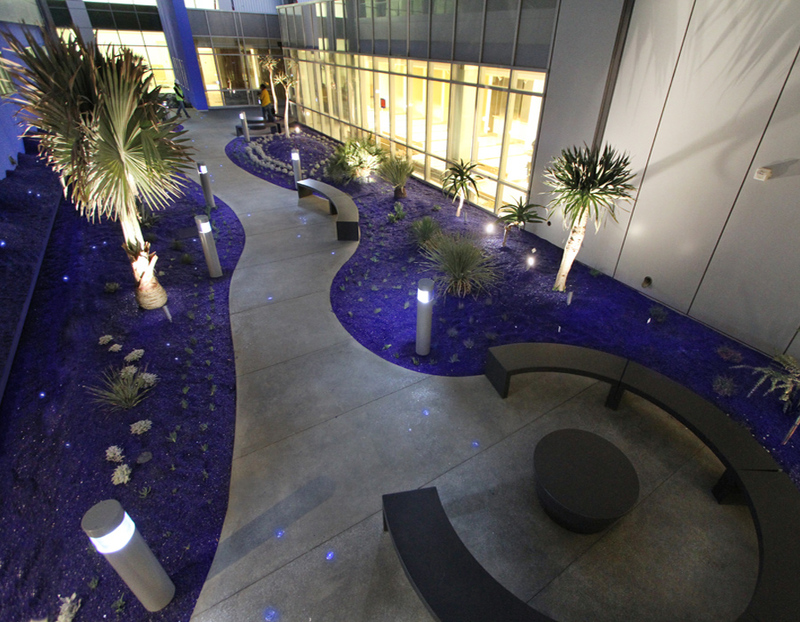 The space is anchored by 33 tons of blue glass mulch, plants with blue colored leaves, and twinkling solar blue lights in the walkway and planting beds. 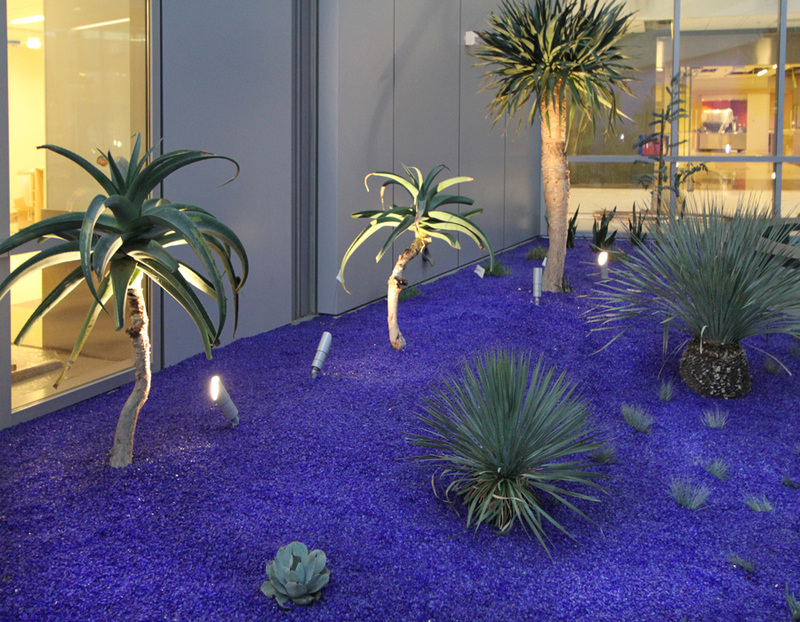 Rather than just using plants that have historically been used to heal, I was interested in creating a space that could help induce calmness and creativity by utilizing the basic tenants chromotherapy and infusing the courtyard with azul. The color blue is a calming color that has been shown to reduce blood pressure as well as calm breathing and heart-rate. It stimulates the parasympathetic system and has anti-inflammatory and muscle relaxing effects. It can be used to assist in relaxation and fights physical and mental tension. 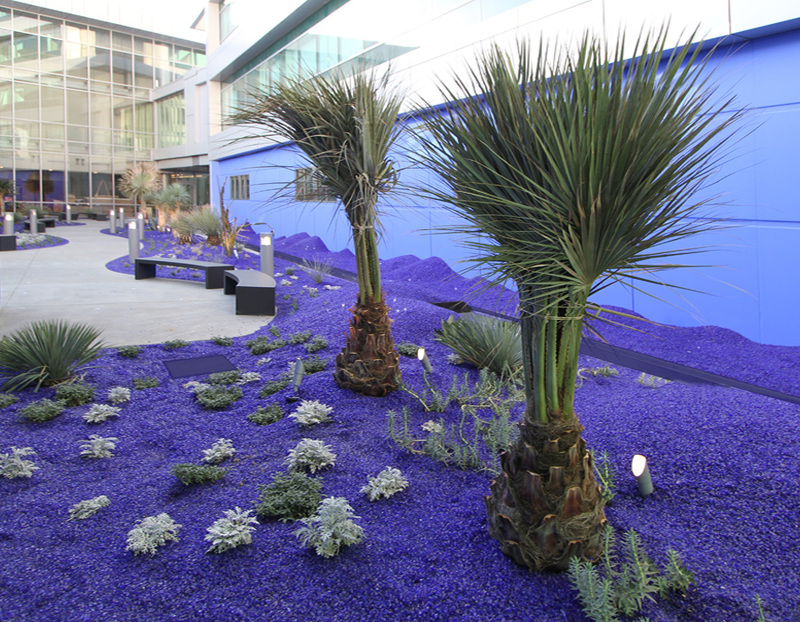 A blue environment has been demonstrated to make us more responsive to new ideas and increase creativity. When people relax, they become more open to new ideas and can develop creative solutions to problems. The tall plant on the right is the Dragon Blood Tree. When the bark or leaves are cut they secrete a reddish resin called “Dragon’s Blood” that is used to stain the wood of the Stradivarius violins. It also has a number of traditional medical uses and was used by the alchemists. 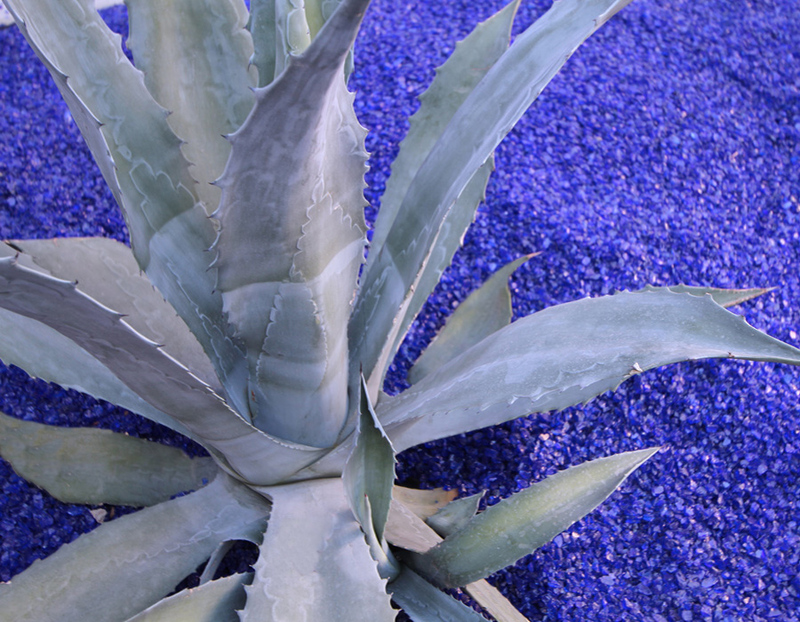 All of the plant material in the garden has “blue” or blue-gray colored leaves. Colour Therapy dates back thousands of years and to the ancient cultures of Egypt, China and India. Each color has a distinguishing wavelength and energy. The energy of each of the seven spectrum colors (red, orange, yellow, green, blue, indigo and violet) corresponds with the seven energy centers or chakras of the body. Color therapy can provide balance among all of the energies in our bodies. Color can help humans on a physical, psychological and spiritual level. Historically, the ancient Egyptians built solarium rooms with various colors of glass and other cultures used silks of different colors to bath their bodies in various shades of light. The ancient Egyptian temple of Heliopolis had a quartz crystal in the dome that split sunlight into the seven colors of the spectrum each of which filled a healing chamber. Each chamber was a place for people to receive color healing and contained herbs and colored materials. In his text “The Canon of Medicine,” Acivenna wrote about the relation of color to physical conditions of the body and viewed blue as a blood cooler. In the states, in 1876 Augustus Pleasconton wrote, “The Influence of the Blue Ray of the Sunlight and of the Blue Color of the Sky,” in which he discusses the positive influence blue can have in crop growth, livestock and human health. A few years later, in 1878, chromotherapy, the use of stained class and colored lights for healing, is suggested for the healing of burns, nervous excitability and cold in the extremities by Dr. Edwin D. Babbitt. Today, color is still used for healing. Natural therapists are using chromotherapy and successes have been reported in the recovery of stroke victims and other patients with chronic depression. The color BLUE is a calming color that has been shown to reduce blood pressure as well as calm both breathing and heart-rate. It stimulates the parasympathetic system and has anti-inflammatory and muscle relaxing effects. It is linked to the throat and thyroid gland. It can be used to assist in relaxation and fights both physical and mental tension. 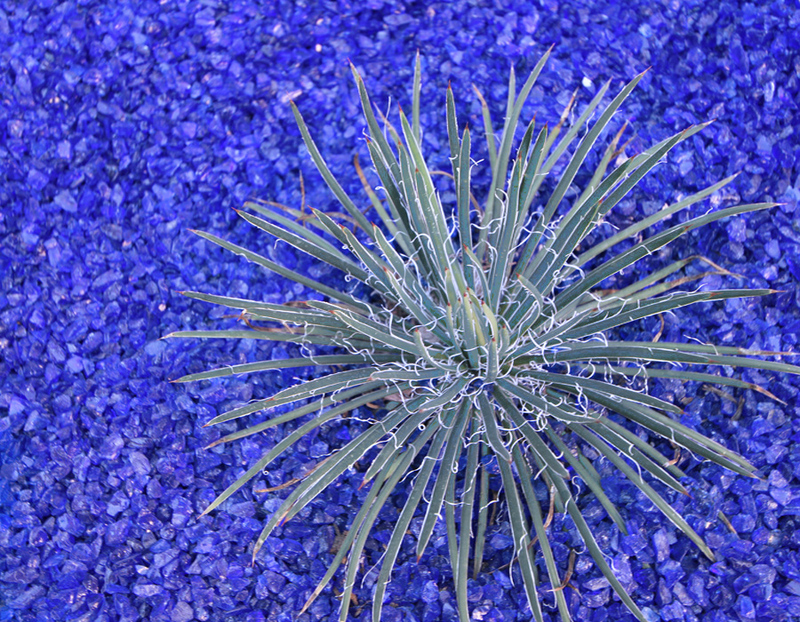 Blue can also make us more responsive to new ideas and increase creativity. A study at the University of British Columbia, in which participants conducted various tasks on a computer screen with red or blue backgrounds, concluded that blue encourages motivation, “people relax, becoming more open to new ideas and creative solutions to problems.” Blue can also increase confidence and make people feel happier. General exposure to color is beneficial as well. In a study at the Mind Lab, “subjects exposed to colours completed mental tests up to 25 per cent quicker. Reaction times were up to 12 per cent faster, while hand-eye co-ordination and the ability to recall a list of words were also found to be improved.” Color affects the body, brain activity and biorhythms and as a result is being used in the treatment of diseases. In Ayurvedic medicine, blue is identified with the fifth chakra, it is located in the throat and associated with the throat, ears, mouth and hands. Its alleged function is physical and spiritual communication. -Deep blue has proven to help the skeletal structure by keeping bone marrow healthy and it stimulates the pituitary gland that regulates sleep patterns. This paper analyzes the historic practices and scientific principles of chromotherapy and looks at the relationship between the human body and colors. This paper by Nathalie Hoang et al. examines cryptochromes in flies, humans and mice. In plants, cryptochromes absorb and process blue light and aid in growth and seed development. The exposure to blue light also reduces flavin pigments and this reduction promotes growth by activating the cryptochromes. In humans the crypotchromes are present and regulate the circadian clock, Hoang found that flavins decrease in humans in response to blue light too. A study conducted by The Mind Lab finds that exposure to light is generally beneficial and certain colors, including blue improve mood and confidence levels in men and women. Hamilton, Jon. “NPR Stories.” 6 February 2009. NPR. 9 December 2011 . Swaine, Jon. “Blue light ‘makes you happy’.” The Telegraph 6 January 2009: 20. 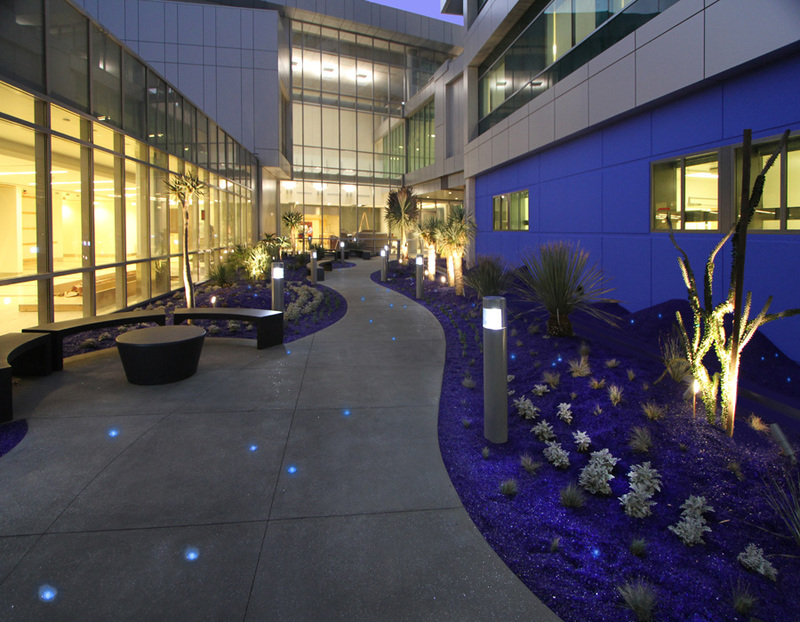 This entry was posted in environmental site works, public art and tagged art garden, artwork, azure healing garden, blue garden, blue lights in garden, corson studios, dan corson, healing garden, los angeles hospital garden, magical garden, MLK garden by dan. Bookmark the permalink.